Think grey hair is over? Think again. The hairstyle trend is stronger than ever, with over 10,000 people in the UK alone searching for ‘grey hair dye’ each month. And have you seen Pinterest lately? It’s like a unicorn spewed up hairstyles. According to research by L’Oréal Professionnel, nearly four in ten (38%) women say platinum is the new blonde shade, and 28% said that they are embracing grey or considering silver/platinum for their hair colour. 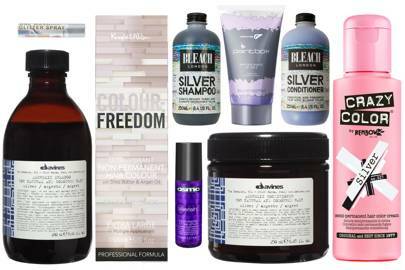 This could explain why the L’Oréal Professionnel Silver Shampoo sales are soaring (they’re up 55%), and new L’Oréal Professionnel colour collections like Majirel Metals, including shades like Silver Star, are responding to epic demand. If you’re worried taking the silver plunge will leave you with some all-too-obvious regrowth, never fear. 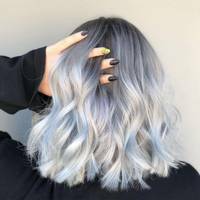 Grey hair balayage is also a thing, employing the same darker roots, lighter ends method of the OG to cleverly disguise your true colour coming through. “In order to go grey you have to pre-lighten the hair to a clean white blonde and then tone with a personalised grey mix tone”, says Headmasters’, Siobhan Jones, who was responsible for turning Little Mix’s Jade Thirlwall hair silver. However, if you’re looking to take your grey all the way to the roots, be prepared for a slight burning sensation from the bleach. When our Fashion Editor Charlie went white blonde, she warned that the scalp can get a little uncomfortable as the wait time goes on. Hair stylists have definitely been noticing a rise in requests for this modern hair phenomena. “Grey is the new blonde!”, says Celebrity Hair Stylist and British Hairdresser of the Year Nominee, Jamie Stevens. If you like the idea of this experimental colour, but don’t want to commit, there are several at-home products which allow you to dabble in silver strands. Prep your locks with Fudge’s White Shade of Pale toner, £10.36. For a subtle blonde/silver hue, give the Colour Freedom Silver Blonde, £4.65 a go. For a more full on grey shade, the Crazy Colour silver hair dye, £5.39, is ideal. Bleach London’s Silver shampoo, £6.50 eliminates brassy tones and helps to maintain a silver hue. Davines’ Alchemic Shampoo in Silver Fox, £15.80 & Conditioner, £20.40 in Silver Grey are also lovely products for maintaining silver/grey locks. Finish with OSMO’s Violet Tone and Protect Styler, £4.99 to protect your colour.